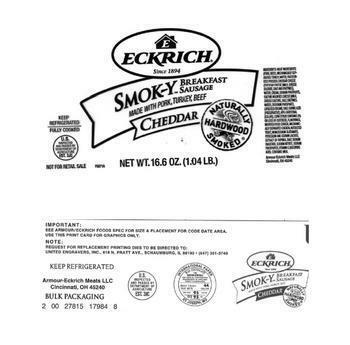 Armour Eckrich Meats of Junction City, Kan., is recalling approximately 90,978 pounds of ready-to-eat breakfast sausages. The recalled products, bearing establishment number “EST. 3JC” inside the USDA mark of inspection, were shipped to distribution centers in Arkansas, Indiana, Kansas, Louisiana, Oklahoma and Texas.